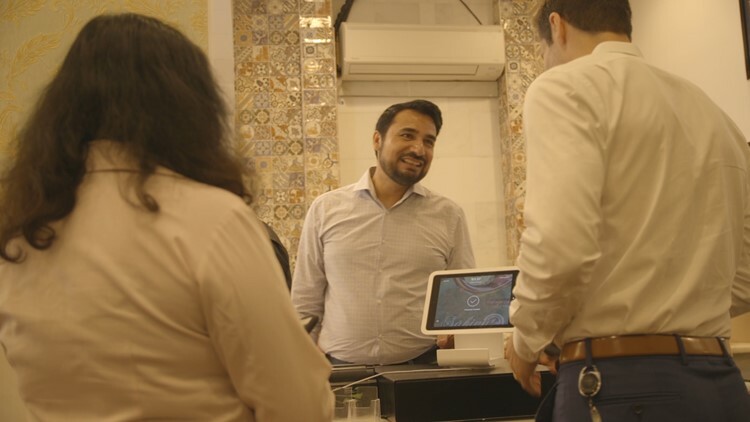 From poverty in Pakistan to prosperity in America, a restaurant owner is continuing his mother’s tradition of helping others. He gives food to thousands of homeless people and feeds his soul in the process. Kazi Mannan owns Sakina Halal Grill, located just blocks away from the White House. But he is more than just the restaurant’s owner. He helps his team by taking orders, serving food, cooking in the kitchen and greeting customers. Some of the customers aren’t the typical clientele you’d find during lunch rush hour. Eating together with businessmen and women are the homeless. Their tired shoes and worn clothes stand sharply in contrast of those in suits, ties and heels. This is how it is for every meal at the Sakina Halal Grill. That’s because Kazi made a promise: anyone who needs a meal, even if they can’t pay for it, is welcome. Part of the reason Kazi helps the homeless is he knows what it’s like to be in need. He was one of 11 siblings raised in Kuri, a small village in Pakistan. Growing up, he didn’t have electricity, running water or even a building for school. Classes were held underneath a tree, and if it rained, they were cancelled. But for Kazi, extreme poverty was the norm, and he recalled feeling blessed. “My mother, I really greatly appreciate how she taught us in our upbringing to thank God, that was the attitude,” said Kazi. When cooking dinner, Kazi’s mother, Sakina, would send her children to deliver some food to their neighbors, even though their supply was extremely limited. “That was her way of worshipping God,” said Kazi. So, when Kazi landed in the United States, he carried with him just $3 and his mother’s teachings. He left Pakistan in hopes of being able to support his family. In just three days after his arrival at Dulles International Airport, he was employed at a gas station. He worked 16-hour days, seven days a week. Every dollar he made he sent home. Then, fate stepped in in the form of a limousine driver. The driver was also from Pakistan, and the two struck up a conversation. The driver took Kazi under his wing and helped him enroll in a licensing program. Soon, he was making $500 a day. It was finally enough money to support his family and himself. After years of hard work, Kazi felt comfortable enough to start looking for other opportunities. “I used to cook at home and my friends were like, ‘Why don’t you open a restaurant because you cook so good?’” Kazi recalled. The idea quickly became Kazi’s dream. Opening a restaurant would be his way to give back, just like his mother did. Kazi got his chance when a friend decided to sell his restaurant. Kazi jumped at the opportunity and immediately offered a down payment. He took over and changed the name to Sakina Halal Grill, a credit to his mother. In addition to the name change, Kazi upheld his mother’s teachings in two other ways. First, he hired is brother as a chef, and they used her recipes in the kitchen. Second, he welcomed those in need. On the opening day in 2013, Kazi walked to a nearby park and invited dozens of homeless individuals to his restaurant. In just five years, those first dozen customers turned into thousands. Kazi estimates he feeds 16,000 people in need each year. For anyone who questions why he would give away so much, Kazi has a message: Let’s stay human.